" The first rule of creating a startup is ... " (Long Intentional Pause) Drumroll.... I was not sure if the students for whom I was giving this talk for felt my anxiety. I could not read anything from the looks of the brave ones sitting in the front row. It was the second time I was invited to talk to the students of the University I graduated from a few years earlier. A year prior I did a presentation about the Semantic Web and to this day people there remember me because of it. But ... that's a story for another post. This time my talk had to get students excited about entrepreneurship. In my early days as a student my goal was to be developer at Microsoft. To be able to write code for the most respected company in the world seemed like the most awesome thing ever. I believe they were not so far apart from that sort of thinking. "The first rule of creating a startup is .... not trying to be Steve Jobs". BOOM. Who saw that coming? I could barely believe what I said. After all Steve Jobs was one of the people who inspired me in the early days. But I wanted to challenge the old ideas that you need to change the world to get started. Sara Sarasvathy, a professor at University of Virginia, put that idea to the test. She conducted interviews with 30 entrepreneurs from variety of industries whose companies range in value from $200 million to $6.5 billion. Let's just say they are what someone would call successful entrepreneurs. What she found that they were acting more like amateur time-pressed cooks, checking what is in the fridge first and then deciding what they can cook for dinner. They were clearly not 5 star chefs who dreamt the perfect recipe and spent a lot of time hunting for the perfect ingredients. It is the opposite of vision driven work. Sarasvathy uses the term "effectuation", a way of examining what means and materials you have available and then imagining what you could do with them. Effectuation is about exercising a high level of control to deal with a future you can not predict. Vision, on the other hand, is as much about control as it is about prediction. To sum up entrepreneur's greatest gift is in fact controlling a future that can not be predicted. How can you control a future you can not control? 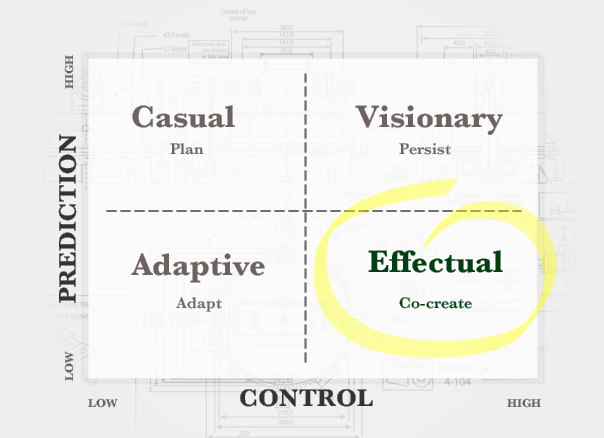 Through effectual co-creation. You can get the paper or read an article from INC magazine about it. He goes to show that creativity is really about taking old ideas and making them new. He says that there are no real "new" ideas; just ones that have been "remixed" from others. It shows how everything from Led Zeppelin to Star Wars and from art to technology, not to mention science is based upon hundreds if not hundreds of thousands of uses of other people’s creations. He doesn't touch on Apple and Steve Jobs but if you are vaguely familiar with Apple's history you will recognize the same pattern. All in all my presentation went ok. At the end some of the students clapped. But I didn't get any reactions. Nobody came by afterwards to ask me questions. Or to discuss things further. Following me, a good friend of mine electrified the audience by focusing on "Vision". With a capital V. "Change the world" he said. The crowd went crazy. "Make a difference" More cheers. I hope some of them became entrepreneurs. I want to think some of them would change the world. But on that day I didn't manage to rebrand myself. In their eyes I remained the guy from the Semantic Web presentation.